"Great with meatloaf, or any meats. Made with plums, apples, and onions basically." Working in batches, place the apples, plums and onions into the work bowl of a food processor, and grind until fine. Transfer the ground fruit and onions into a large pot, and stir in the malt vinegar, sugar, salt, Worcestershire sauce, garlic, ginger, nutmeg, allspice, and cayenne pepper until the mixture is well combined. Bring to a simmer over low heat, and simmer until brown and thickened, about 3 to 4 hours. Sterilize the jars and lids in boiling water for at least 5 minutes. 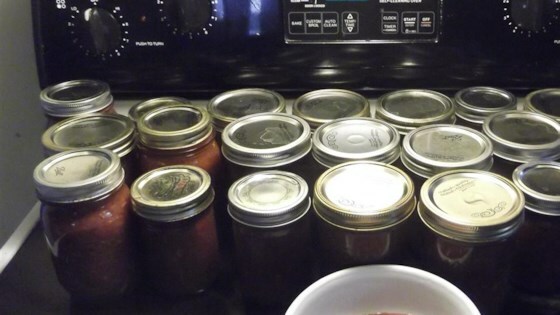 Pack the sauce into the hot, sterilized jars, filling the jars to within 1/4 inch of the top. Run a knife or a thin spatula around the insides of the jars after they have been filled to remove any air bubbles. Wipe the rims of the jars with a moist paper towel to remove any food residue. Top with lids, and screw on rings. Place a rack in the bottom of a large stockpot, and fill halfway with water. Bring to a boil over high heat, then carefully lower the jars into the pot using a holder. Leave a 2 inch space between the jars. Pour in more boiling water if necessary until the water level is at least 1 inch above the tops of the jars. Bring the water to a full boil, cover the pot, and process for 10 minutes. Learn this easy way to make brown butter sauce and a simple sole meuniere. Imagine A-1 steak sauce with an extra kick. I make this for my husband, and to give away as gifts; this year I added grated zucchini.